Rabbit-Proof Fence -- featuring the Golden Globe®-nominated score by Peter Gabriel -- is a powerful true story of hope and survival. At a time when it was Australian government policy to train aboriginal children as domestic workers and integrate them into white society, young Molly Craig decides to lead her little sister and cousin in a daring escape from their internment camp. Molly and the girls must then elude the authorities on a dangerous 800-mile journey along the rabbit-proof fence that bisects the continent and will lead them home. 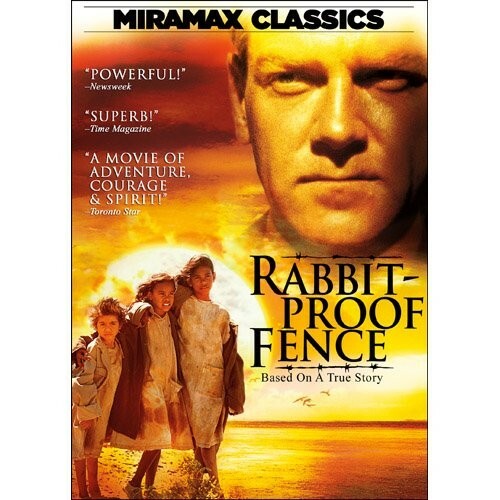 Rabbit-Proof Fence captures their universally touching plight and unparalleled courage in a beautiful testament to the undying strength of the human spirit. For more girl-empowering films, visit A Mighty Girl's Movies / TV section. Based on a true story, Rabbit-Proof Fence moves with dignified grace from its joyful opening scenes to a conclusion that's moving beyond words. The title refers to a 1,500-mile fence separating outback desert from the farmlands of Western Australia. It is here, in 1931, that three aboriginal girls are separated from their mothers and transported to a distant training school, where they are prepared for assimilation into white society by a racist government policy. Gracie, Daisy, and Molly belong to Australia's "stolen generations," and this riveting film (based on the book by Molly's daughter, Doris Pilkington Garimara) follows their escape and tenacious journey homeward, while a stubborn policy enforcer (Kenneth Branagh) demands their recapture.